Join Us for an AWWP Benefit Screening of Acclaimed Documentary FRAME BY FRAME in Tucson, Arizona on April 9th! When the Taliban ruled Afghanistan, taking a photo was a crime. After the regime fell from power in 2001, a fledgling free press emerged and a photography revolution was born. Now, as foreign troops and media withdraw, Afghanistan is left to stand on its own, and so are its journalists. Set in a modern Afghanistan bursting with color and character, FRAME BY FRAME follows four Afghan photojournalists as they navigate an emerging and dangerous media landscape—reframing Afghanistan for the world, and for themselves. Through cinema vérité, intimate interviews, powerful photojournalism, and never-before-seen archival footage shot in secret during the Taliban regime, the film connects audiences with four humans in the pursuit of the truth. Join us for a screening of the acclaimed documentary FRAME BY FRAME to benefit the Afghan Women’s Writing Project. This event is co-sponsored by the University of Arizona. A portion of ticket price is tax-deductible. Complimentary popcorn and soft drinks will be served. Please Join Us! 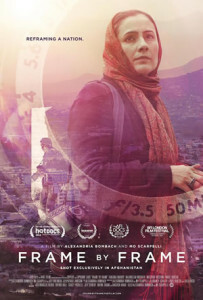 This is a fantastic movie and for those of us who would love to see Afghanistan and cannot, this will give you the opportunity to be an armchair tourist while supporting AWWP!!! Get your ticket now!